A catch-all in celebration of the AAF opening today! I need an AAF team. Edited title. Congrats to the Orlando Apollos, the de-facto AAF all-time champions! ESPN article on Christian Hackenberg and his path back to starting QB, which is really an article on how he fixed his throwing motion. which is really an article on how he fixed his throwing motion. A little over a year ago, his throws lacked any control, and he needed to figure out why. The only passing game in the AAF that seems to be clicking is Steve Spurrier's offense in Orlando. Speaking of Orlando, interesting story: because Florida law excludes pro athletes from filing worker's compensation claims, the Apollos are going to start holding their practices in Georgia. That seems ludicrous. Was pro athlete workers comp such a problem that they had to regulate it? I just don't get the "small government or die" motto except when it sticks it to someone else. Christian Hackenberg, using his newly fixed throwing motion, played like hot garbage for the third straight week, getting benched for Zach Mettenberger. Mettenberger then rallied the team to a near-comeback, going 9-of-12 for 120 and 2 TDs, and looking like a guy with an NFL-caliber skill set. How anyone watched both of these guys practice and though Hackenberg was the guy to start, I'll never know. (Unless Hackenberg is a totally different guy in practice though, history has shown that not to be the case). Oh, right, we're talking about Mike Singletary here. 52% completion, 79 passer rating. How he was a 5 star recruit boggles the mind. Sam's out there on Twitter calling Hack's football career a ponzi scheme. This feeds my soul. AAF passing is still being dominated by Spurrier's Apollos and quarterback Garrett Gilbert, aka "the college freshman whose first near-full college game was the 2009 national championship, where he took Alabama to the wire". Gilbert's been a camp arm in the NFL since getting drafted in 2014. He got his first NFL action last year after the Panthers brought him back after they shut down their top two quarterbacks. My real surprise is that some teams play the same opponent within 2 weeks of their first game. I hope Hackenberg stays benched. I only watched him in week 1, but even then I coudn't believe that he was the best that Memphis had on their roster. I was tempted to praise Birmingham's defense for how few points they have allowed compared to all other defenses in the league, but then I had to remind myself that their three opponents so far have a combined 1 win after 3 weeks of play. And yet Trent Richardson continues to make plays. Admittedly, he's scoring touchdowns, which is different from being good as he's still rushing at sub-3 ypc. He is rushing the ball more than anyone else, which I guess is leading the league in something! Yeah TRich is just grinding out those goal line TDs. Zac Stacy has looked impressive, you can tell he's finally healthy again. The league's leading rusher, Ja'Quan Gardner, was a 49er for 3 days last year, getting signed right before the final preseason game and cuts (following the rash of RB injuries the team suffered in the preseason). Maybe he merits another look. Is it just me, or does the AAF website need some serious improvement? There is no standings page I can find, and I can't seem to find an easy overview of win-loss records as a result. Yeah, the website is almost as garbage as Hackenberg. Which is an almost universal trait of every startup football league. Simple things like standings and stats are somehow monumental tasks that they couldn't possibly manage. I’ve watched the highlights of several games and I’m enjoying it. I find I dig the modern uniforms and the play—at least the highlights—seems decent. Though I’m seeing quite a few field goals and touchdowns seem rarer than I’d’ve expected. All of the team logos look like the ones you would see in a video game without an NFL license. I’m super down with that. I’m trying to figure out how their logos were supposed to look like anything else. Garrett Gilbert to Charles Johnson remains the most lethal offensive attack in the AAF by far. I expect we're going to see Johnson in an NFL camp this year. He worked his way into a starting WR job for the Vikings for a time, but a down year in 2016 followed by a knee injury the following year really took the wind out of his career's sails. At 410 receiving yards, Johnson has over 100 more than second place. Gilbert is also way out in front in passing yards, but our boy Luis Perez has 2nd place locked down. Mettenberger is already 7th in passing yards and 3rd in passing TDs despite only playing 1.5 out of the 4 games played. Finally found time to watch week 4 Birmingham vs San Antonio. What an impressive defensive game by San Antonio. Perez was under pressure most of the time. Richardson couldn't do much of anything rushing (pretty good catching and blocking though). Having several injuries on the Iron offensive line obviously made the Commander's job easier in that respect. SA also had some nice rushes. Considering their awful starting field position on most drives, if only they had had fewer penalties, they should have won by at least another TD. Wow, what a goalline stand at the end! SA tried to get in six times from inside the 2 and was denied. Every. single. time! I want to see more of what Ross can do carrying the ball! I understand Perez was constantly about to be crushed by some huge defensive guy barreling at him, but his decision making is still questionable more than it should be. The first half was especially problematic. This weekend I'll be interested to see if San Antonio just started a win streak, and if Birmingham can get their offense working again. Another thing I've been wondering about....if top tier players are in the NFL, and second tier players in the AAF, Arena, and CFL, where is the XFL going to get enough talented players from to make their business model work this time? According to XFL 2K, the quarterbacks are expected to be offered a $300,000 salary which is more than an AAF quarterback will make over the three-year life of their $250,000 contract. Question is, will that be enough? Because here's the part that should scare the sh*t out of the XFL: the NFL is starting to take the AAF seriously. The discussions at this point are described as "informal", but the notion of the NFL moving players between themselves and the AAF like a bona fide minor league is being raised. The AAF, of course, has wanted to nurture that idea all along. They surmised - and rightly so, I believe - that the best shot of getting there was to get up and running and showcase a level of play in the ballpark of old NFL Europe. They're not quite there yet, but it's easy to see how they could be there with NFL teams allocating talent to the league like the NFL Europe league operated. Every week that the AAF has NFL bubble-caliber players playing meaningful snaps and doesn't have questions about solvency is a great week for the AAF. The XFL would have a hard time positioning themselves the same way, when their name is synonymous with being antagonistic towards the NFL, rather than seeking cooperation. They might not try to pitch it that way this time around, but the name is tied to that schtick. They would have a much harder time getting the NFL to take them seriously and consider them an option for a minor league relationship, assuming the XFL was even interested in pursuing one. Given the XFL's extra year of ramp-up time, it's not encouraging that the only coach they have announced is Bob Stoops, who apparently sees being both GM and head coach in the XFL as merely a part-time job. My feeling is that the AAF is taken much more seriously by football types, and while their long-term survival depends on a closer partnership with the NFL, I think they have a decent shot of getting that partnership, as long as they can keep themselves afloat long enough. I've only caught a few minutes of a couple games live, via the AAF app. I'm so used to commentary that I can't really stand watching without it. I have watched most of the highlight reels on YouTube for the season, though. The best? This week's Salt Lake/San Diego game. Came down to the wire. He was signed by... Memphis! Because of course he was. Mettenberger didn't have a great game this week, so let the wheel of NFL flameout QBs spin once more! Football Outsiders discusses the AAF. A lot that I agree with there. Particularly, the need to nurture a connection with the NFL, the regional, under-served market approach, and playing on TV on cable networks alongside MLS and other such tier sporting events. It's good to see that they're doing well on the cable tier, having more of their games picked up on TNT and CBS Sports. The latter is particularly the kind of network where this league is destined to live. The one thing I don't think they emphasized enough is that the future of the AAF depends on establishing legitimacy. When the league gets players NFL camp invites, and gets players onto practice squads and even active rosters, agents will start pushing the AAF as an option that their marginal clients should explore. The league did a great job getting the player and coaching talent that they managed for a start-up year, but there's a lot more talent that they should be able to convince to join the league if they can establish that legitimacy. Season’s over, right? Just six weeks? 10 plus playoff game and championship. Majority investor: Alliance of American Football in danger of being discontinued without NFLPA help. The first-year Alliance of American Football's inability to secure cooperation from the NFL Players' Association to use young players from NFL rosters has put the AAF in danger of folding, Tom Dundon, the league's majority owner, told USA TODAY Sports on Wednesday. "If the players union is not going to give us young players, we can't be a development league," said Dundon, who invested $250 million into the league in February. "We are looking at our options, one of which is discontinuing the league." However, a players' union official did express serious concerns about the risks of lending active NFL players to the AAF. The official requested anonymity because of the sensitive nature of the issue. The person said the players' union is founded on the belief that using active NFL players and practice squad members for the AAF would violate the terms of the CBA and the restrictions that prevent teams from holding mandatory workouts and practices throughout the offseason. The limitations set in place are designed to ensure the safety and adequate rest and recovery time for football players. But there’s a concern that teams would abuse their power and pehaps force young players into AAF action as a condition for consideration for NFL roster spots in the fall. I'm going to go out on a limb and say that if this is actually the issue that'll make the AAF fold, then the AAF will fold. 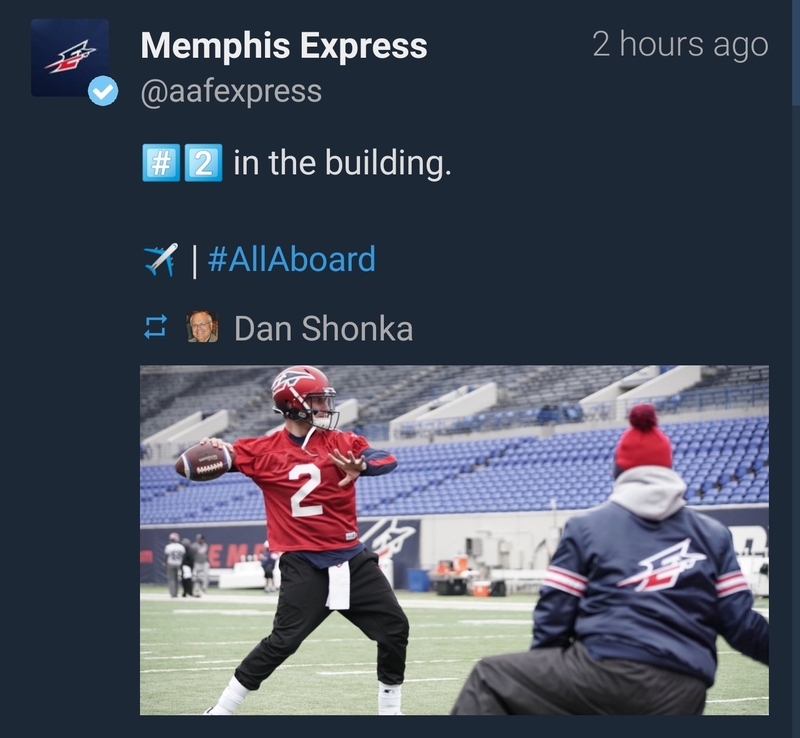 AAF really wants to be that developmental league, but I think this dude is playing their hand a little too hard here. 32 NFL teams cut down from 90 to 53 from the start of training camp to the beginning of the season. Add in a 10 man practice squad, and that means of the original 90, 27 guys are out completely. Multiplied by 32 teams, and that's 864 guys. As for practice squad players, the practice squad does not exist during the AAF's season. It only exists from the start of the NFL regular season through the end of it. Practice squad contracts expire the day after their team's season ends. NFL teams do then sign a number of these players to reserve/futures contracts in order to have them in camp the next season. These are probably the players the AAF guy is talking about, but strictly speaking, they're not on a practice squad at the time the AAF is in operation. Not every one of the 300 practice squad players gets signed to an active roster or a reserve/futures contract following the season, so some of those guys are going to be in the AAF's potential player pool alongside the 864 camp-cut players. I'm going to say about 2/3rds of PS players get contracts to return next year (basing this on the Niners, who signed 6 of their 10 to futures deals at the end of 2018), so let's say another 100 such players joining the camp-cut pool. That gives us 964 players who were in NFL training camps the previous season. The 8 AAF teams have 52 man rosters, so 416 players. They've got 964 names of players who were in camps last year but were either cut loose or were not offered a futures contract at the end of the year. Some of these players will have signed to active rosters during the season as injury replacements, but most will have been on 1-year deals and will again enter the offseason without an NFL contract. That's the main player pool for the AAF to pull from. Now you can also add in guys that were not in NFL camps the previous season, but had been in NFL camps earlier than that. I don't have an estimate for what this number is, but it's likely to be pretty sizable too, typically guys who sustained an injury that prevented them from being camp-ready the following year. Finally, every year there's a new pool of players fresh out of college who did not get drafted or signed as undrafted free agents. There's approximately 256 drafted players and about another ~300 undrafted free agents out of the ~3000 draft-eligible college players. I don't know how much of that undrafted/unsigned pool are players that are even interested in professional football, but I do know every year that there are a good number of draft-eligible players who sign with an agent and don't end up drafted or signed as a UDFA. This pool of players would also be ripe for the AAF, as I would call having representation a good indicator of a prospect's interest in playing football beyond the college level. Being able to be allocated players on NFL futures contracts would be a boon for the AAF talent level, but that's 200 names to add to a pool of what I'll ballpark as ~2000 of camp cuts, recently out-of-the-league players, and agent-represented unsigned draft-eligible graduating college players, from which to build a 400-man league. (The vast majority of which should come directly from those 900 or so camp-cuts and un-futured practice squad guys). I don't remotely believe that there's an existential threat to the AAF here in terms of filling rosters. It's just a question of elevating the league's level of talent. And to elevate it to a certain point, that is going to require a relationship with the NFL that allows player allocation. But there's zero reason they should be unable to maintain what they've built so far. If anything, they should have an easier time convincing guys with NFL camp experience to join the AAF. This first year should have been the hardest year to get buy-in from these bubble players. Thanks for the breakdown Legion. All of that sounds logical. The only thing I'd add is that the AAF is also competing for players from the CFL and Arena Football. How big those rosters are and how many players come from Canada, I can't say and don't have the time atm to research it. About 50% of the CFL is Canadian nationals. Another interesting thing with the CFL is that their most recent CBA took away the option CFL players used to have to pursue NFL opportunities while still being able to return to the CFL and continue under their contract if they didn't make it. Taking that away makes the CFL less appealing to NFL hopeful players. I don't know what a multi-year AAF contract is like yet (and they have signed players to multi-year deals), but I'd guess that they're very friendly to people wanting to join the NFL, as that's the direction the AAF wants to go.